Justin Mathieu grew up just south of Boston in Raynham, Mass, and attended Thayer Academy where he was a 3 sport athlete and 2 sport Varsity captain. In the background lingered this love for animals – his family had a field bred yellow lab who started his longing to work with canines long-term. Coming from a high school that was mostly sending people to college for sports or academics, it was a bit out of place to want to go into a profession like “dog training” – Justin attended Suffolk University for 2 years studying Criminal Justice and in that time he purchased his first dog, Mila, a brindle pitbull who would, quite literally, change his life. Justin then decided it was time for change. In early 2012 he decided it was time to move to California. He knew no one where he was going, all he knew was that he needed change and this was a good start. Justin continued in school at Santa Monica College while working with a local club, training his dog and finally getting the kickstart he needed to get this dog thing rolling. Mila was a bit of a problem child and without her Justin would not have had to seek out help and more knowledge like he needed. After training in the Long Beach, CA area for about a year, Justin was beginning to dive deeper into the dog world and found out there really was a career for him to make of this. He made the difficult decision to put his Criminal Justice degree on hold, move up to Northern California and attend Michael Ellis’ School for Dog Trainers. Once Justin spoke to Michael for the first time, they connected and he knew he was making the right choice. About a year or so after moving from Boston to Santa Monica, Justin decided it was again time for change. At this point he had gotten into showing dogs and had gotten his first “show dog” an American Pitbull Terrier, named Axel. So with his two pups, Justin headed north to American Canyon, California and went to meet some people who’d change this journey for the better. Justin attended Michael’s Immersion Program for 4 months, completed all of his courses, and got some valuable one-on-one time with Michael Ellis and Lisa Maze. This brought him to where he is today. When Justin finished Michael’s school and was planning to move back home to Boston in the coming months, he knew it was time to put his training to the test. Michael gave Justin the chance to own one of his dogs, and that is where Silo comes in. 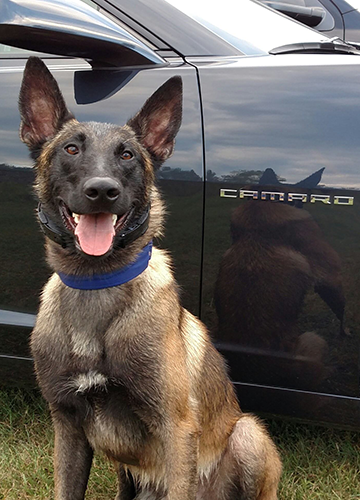 Silo is Justin’s first Belgian Malinois and was an opportunity to put his training and everything he had learned to good use. With Silo only 11 weeks old, Justin, Mila, Axel, and Silo drove back cross-country to Boston to start Justin’s dog training career. Once in Boston we began working with local trainers, training all disciplines, obedience, agility, bitework, ringsport, and police K9 training. Silo competes in dock diving, French Ring, Mondioring, and does police work to help Justin with his training. 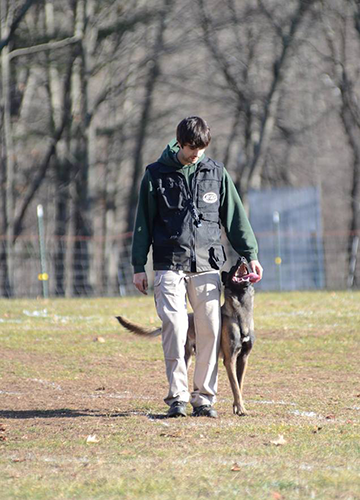 Justin helps to train most of the local police K9s in and around the Boston area. Herbsmith is honored to have the two of them as a part of their team!